The antique-furniture universe is filled with terms or phrases that sound similar but actually refer to different things. Periodically we examine a pair of these "soundalikes", and give you succinct explanations of what they mean, how they differ, and how not to confuse them. Though the furniture terms settle and settee are often used interchangeably—in fact, one looks like a misspelling of the other—these names refer to two distinct types of antique seating. Let's take a look at the differences between the settle and the settee. An extremely old piece of furniture, the settle evolved in Europe during the late Middle Ages as a more comfortable variation of a plain wooden bench. Not that (by today's standards) it was very comfortable, consisting as it did of a tall, straight back, sometimes hooded, and arms or side-panels. Still, it did provide support for the sitters' back and arms along with shelter from the direct heat of a fireplace or drafts during winter. Blankets and pillows often softened the seat a bit, too. As a substantial, permanent piece of furniture (versus a portable bench or stool), capable of accommodating at least two people, a settle actually indicated stability and wealth in a household. It continued to do so up through the 1600s—until another sort of seat began to supplant it. Enter the settee. Although early examples date from 1620, settees began to really develop around the turn of the 18th century (according to Webster's Collegiate Dictionary, the word was first used in 1716). Basically, they consisted of an armchair—the open-arm fauteuil, itself relatively new furniture type - extended lengthwise to accommodate two or more sitters. In fact, many early settees resemble two co-joined chairs: separate backs with a shared seat and multiple legs. Just as the settle was more comfortable than the bench, the settee was easier to sit on than the settle. One key feature in this comfort is that many settees had padded upholstery on the seat, the back, and the arms. Another comforting feature is a gentle curve to the back, following the shape of the spine, found in some settees. As the 18th century progressed, settees took on a variety of forms. Some kept the air of co-joined chairs, becoming known as chair-back settees. Others, though, developed the long single-piece back associated with couches today. Some became quite ornate, upholstered in silk or tapestry. A few, conversely, were quite plain—like the Windsor settee, an American variation on the Windsor chair, with an uncovered seat and spindle back. The term settee came to be generic for just about any sort of seat built for two, three or even four. What all settees share are uncovered, fairly high legs; open sides; thin arms; and a general sense of lightness and delicacy—especially compared to the plush, aproned sofas that were to gradually overtake them in the 19th century. For a while, the words "sofa" and "settee" seemed to be used "indistinguishably," according to American Furniture: 1620 to the Present, by Jonathan Fairbanks and Elizabeth Bidwell Bates. 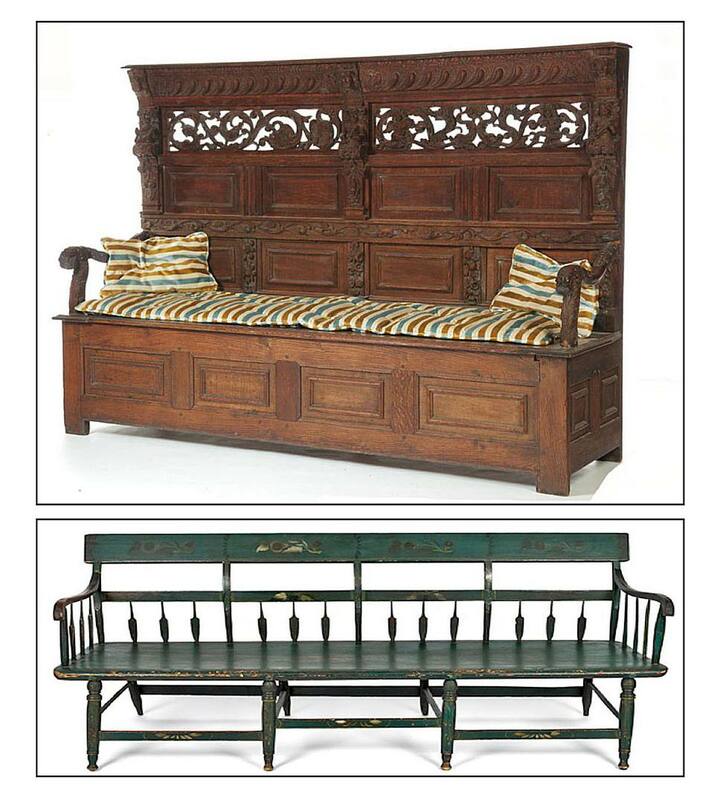 Gradually, "settee" came to mean a more formal piece of furniture (as in, say, a reproduction Louis XVI settee). While somewhat archaic, the term is still in use today, usually applied to a dainty, two-seat couch resting on exposed legs. The settle didn't fade away completely after the settee came on the scene. It continued to exist, but mainly as a rustic or folk furniture piece. Settles were common in colonial and federalist America, often with storage space under the seat or even in the back panel. In the late 19th century, the settle made a comeback—taken up by Arts and Crafts furniture designers, as part of their admiration for medieval crafts and furniture forms. What is a Bachelor's Chest in Antique Furniture?